Located in front of St. Peter’s Basilica, Saint Peter's Square or Piazza San Pietro is one of the best-known squares in all of Italy and is an important gathering place for tourists visiting the sights of Vatican City. Both the square and the basilica are named after Saint Peter, an apostle of Jesus considered by many Catholics to be the first Pope. 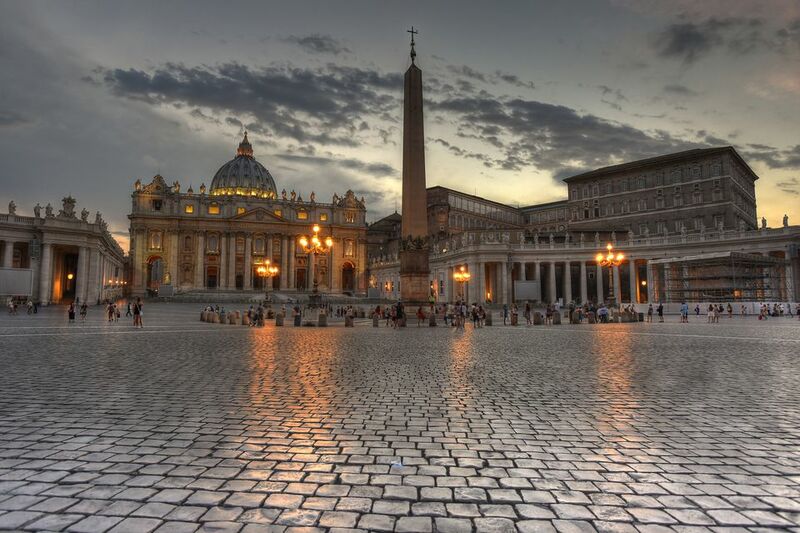 Although Saint Peter's Square is in the heart of the Vatican, many tourists see it as an important part of Rome as well. From St. Peter’s Square, visitors can also see the Papal Apartments, not only the Pope's living quarters but also the place where the pontiff often stands to address crowds of pilgrims. You can visit St. Peter's Square for free 24 hours a day unless the piazza is closed for a ceremony. In 1656, Pope Alexander VII commissioned sculptor and architect Gian Lorenzo Bernini to create a square worthy of the majesty of St. Peter’s Basilica. Bernini designed an elliptical piazza that is embraced on two sides by four rows of imposing Doric columns arranged in a stunning colonnade. The double colonnades are meant to symbolize the embracing arms of St. Peter’s Basilica, Christianity’s Mother Church. Topping the colonnades are 140 statues depicting saints, martyrs, popes, and founders of religious orders within the Catholic Church. The most important aspect of Bernini’s piazza is his attention to symmetry. When Bernini began devising his plans for the square, he was required to build around a 385-ton Egyptian obelisk originally brought to Rome by Caligula around 37 BC, and which was placed in its location in 1586. Bernini constructed his piazza around the central axis of the obelisk. There are also two small fountains within the elliptical piazza, each of which is equidistant between the obelisk and the colonnades. One fountain was built by Carlo Maderno, who had renovated the façade of St. Peter’s Basilica in the early 17th century; Bernini erected a matching fountain on the north side of the obelisk, thereby balancing the piazza’s design. The paving stones of the piazza, which are a combination of cobblestones and travertine blocks arranged to radiate from the central “hub” of the obelisk, also provide elements of symmetry. In order to see the symmetry of this architectural masterpiece firsthand, one must stand on roundel foci pavements located near the piazza’s fountains. From the foci, the four rows of the colonnades line up perfectly behind one another, creating an amazing visual effect. Vatican City is on the west side of River Tiber while Rome's main sites—like the Trevi Fountain, the Pantheon, and the Spanish steps—are on the east. The easiest way to get to Saint Peter's Square is to take the Metro Line A to the Ottaviano “San Pietro” stop. You can also take a taxi and just tell the driver to go to Piazza San Pietro. If you do take a cab, make sure to ask for the price up front to avoid overpaying.